2003's "Pirates of the Caribbean" (and the two subsequent films) showcased its own unique style in the adventure/fantasy genre. A franchise setting its roots from a Walt Disney theme park ride, the trilogy was a mix of pirate booty action, interspersed with myths and beliefs of lore and comedy - mostly presented by Jack Sparrow. The franchise exhibits truly reflects the thrill you get from the ride of its namesake - maybe even more. The well-received franchise was supposed to end with "Pirates of the Caribbean: At World's End" but Disney soon decided that a new trilogy must be made - by hook or by crook. They bought rights to a book and pursued the fourth film even if some character staples decided not to sign up. Can "Pirates of the Caribbean: On Stranger Tides" propel the franchise to new heights even though it lacks the complete cast that made it a hit? Captain Jack Sparrow (Johnny Depp) is captured by the King of England after a botch attempt to save his First Mate from prison. King George II reveals that the Spanish is on a mission to get to the Fountain of Youth - Sparrow must help the English in getting there first. On hand to help him is Barbarossa (Geoffrey Rush) - now a Privateer in the King's Services. Jack Sparrow manages to escape and eventually meets Angelica (Penelope Cruz) - a woman from his past. Angelica double crosses him and takes Sparrow into the Queen Ann's Revenge. Blackbeard (Ian McShane) is also in need of the Fountain of Youth to save himself from a deathly fate. Having no choice, Hector Barbarossa sets off with the help of Jack Sparrow's first mate who reveals he has memorized the map to the Fountain of Youth. Who will get to the Fountain of Youth first - The evil Blackbeard, the powerful English or the religious Spanish? 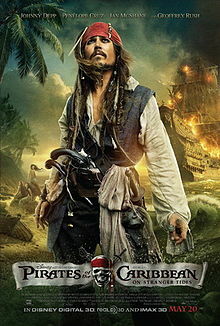 "Pirates of the Caribbean: On Stranger Tides" stands on its own as new film outside the first franchise trilogy. In fact, you won't need to watch the first three films to understand the movie. Most importantly, this has the classic "Pirates of the Caribbean" formula we have all come to love - a fast-paced, non-stop action fantasy film with the quirky antics of a Captain Jack Sparrow. Johnny Depp still does a flawless Jack Sparrow and everyone else did their part in the acting department. What "Pirates of the Caribbean: On Stranger Tides" fails to do though is to present a cohesive and compelling plot. The film definitely feels like a mish-mash of ideas forced to work together. There were also a lot of key scenes that were predictable and cliche`. We also recommend avoiding the 3D version of the film as it was all muddy and dark most of the time. It was a terrible idea from the get-go as all previous films in the franchise have a dark undertone. In the end, even with all its flaws, we still recommend watching "Pirates of the Caribbean: On Stranger Tides". It was a thrilling ride from start to finish just don't expect it to be as deep or as epic as the first three films.